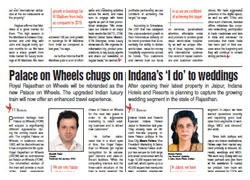 Royal Rajasthan on Wheels will be rebranded as the new Palace on Wheels. Prominent heritage train Palace on Wheels (POW) will acquire a significantly different appearance during the coming tourist season. The original Palace on Wheels, in existence since 1982, will be discontinued as it has completed its life-cycle. Royal Rajasthan on Wheels (RROW) will be rechristened as Palace on Wheels (POW). He further elaborated that in a short span of time, the Royal Rajasthan on Wheels got myriad recognition for its extravagant interiors and state-ofthe- art facilities. “While the compelling interiors and the three-cabin structure of the train is being retained, the exterior of this luxury train will be transformed into the trademark colours of the Palace on Wheels which will enable a much lavish tour for the passengers,” he adds. Worldwide Rail Journeys is a unique and first-of-its kind rail tourism company that enables travelers to book their trip online with ease, enquire for booking information for various Indian luxury trains including the Deccan Odyssey, the Golden Chariot, The Maharajas’ Express and the Palace on Wheels.